We are proud to offer a full dessert table menu including custom cakes, hand painted or piped sugar cookies and candy. We have numerous flavors, fillings and frosting options to choose from to make your dessert table special to you. One of everyone's FAVORITE parts of planning a wedding is the cake tasting!! Sometimes going into a shop can be a little uncomfortable or you just want to be able to pig out in private with your significant other! We have made tasting easy with our fantastic Tasting Boxes! 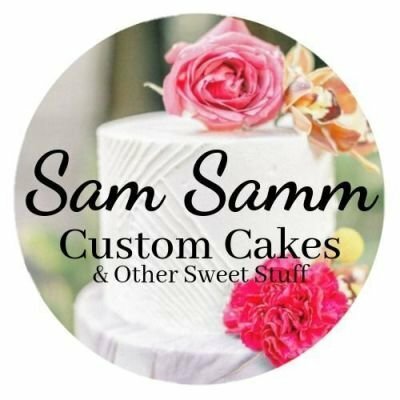 Choose 3 cake flavors, 3 fillings & 3 frostings to create your own custom Tasting Box which is then hand delivered to your location. You taste however and with whomever you please! It can be a quick taste when you have time or (because its portable, forks included!) you can make a date out of it! Once you choose your flavors, let us know and your good to go! Because all cakes are so different, we do not have a specific pricing guide for specialty cakes. Prices will ultimately depend on the cake size and design.